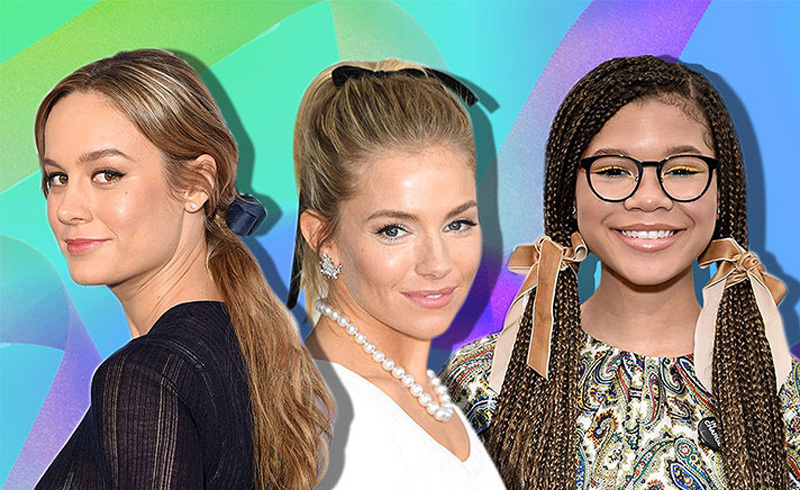 Every year, Hollywood hair trends are equal parts innovative and nostalgia-fueled, like celebs in hair bows or ribbons. In the case of 2018, it was the latter that reigned supreme. For instance, we watched celebs including Hailey Baldwin and Kim Kardashian make the oversized scrunchie a high fashion add-on, while Olivia Culpo, Lucy Hale and so many more put their hair into a time machine and ventured back to the ’90s for a blunt bob. And if that weren’t enough, experts are predicting that some of these throwback looks will only grow in popularity next year. One thing’s for sure: one of them will likely include the use of hair bows or ribbons, since A-listers can’t seem to stop wearing them. Though we typically associate this accessory with the lewks we wore as children–like the classic pigtails–they can also exude a mature elegance when incorporated into anything from a ponytail to intricate updo. And now that we’re knee-deep in another holiday season, we can’t think of a better reason to spotlight some of our favorite red carpet hair bow moments, as at least one is bound to serve as holiday party inspo. Gwyneth Paltrow’s otherwise basic ponytail looks instantly regal when accessorized with a hair bow over the ponytail holder. Not only are we in love with the romantic waves throughout Brie Larson’s low ponytail. The navy blue bow makes it look even more soft and delicate. Karlie Kloss ensured that her loose waves didn’t get in her eyes by securing them with an adorable hair bow headband just above her hairline. As if her ornate diamond earrings weren’t enough, Sienna Miller embodied the glamour of a royal queen by accenting her high ponytail with a hair bow. We love the juxtaposition of a dainty hair bow against Dove Cameron’s messy high ponytail. Who says hair bows have to be short? The length of this one on Elle Fanning’s bun is just divine. Matchy-matchy is never a bad idea. We’re applauding Riley Keough’s hair bow method: by pairing the color with her green eyes. Margot Robbie’s tiny top knot gets instant volume with the addition of a hair bow that extends down the back of her head. Millie Bobby Brown’s space buns looks downright adorable with matching bows on each one. The back of Maria Menounos’ head deserves your full attention, thanks to this set of cornrows that go up into a topknot, accented by a bow. A simple, yet stunning way to accessorize a side braid, courtesy of the gorgeous Emily Ratajkowski. Pigtails, but make them box braids. 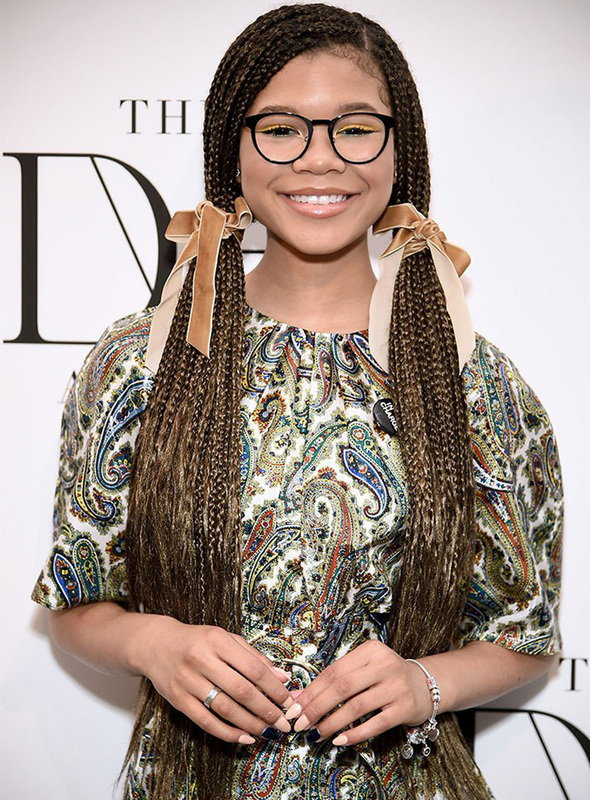 Loving the light brown, velvet bows in Storm Reid’s hairdo. The bigger the bow, the better the ponytail…at least according to Chloe Sevigny.